Stob a' Choire Mheadhoin and Stob Coire Easain (1115m) to the SW are located on a 8km long ridge, separated by a high col (960m) and, consequently, are climbed together. In addition to the main ridge, Stob a' Choire Mheadhoin has a SE ridge, which is craggy on its N flank, leading down to Loch Treig . 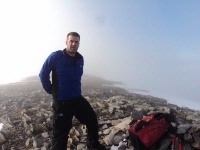 Stob a` Choire Mheadhoin from top of a frosty Stob Coire Easain in October. The view across to Stob a` Choire Mheadhoin from lower on the ridge; wonderful snow shapes and knee deep snow made for a hard days going , but in fabulous weather. Stob a' Choire Mheadhoin viewed from the summit of Stob Coire Easain. 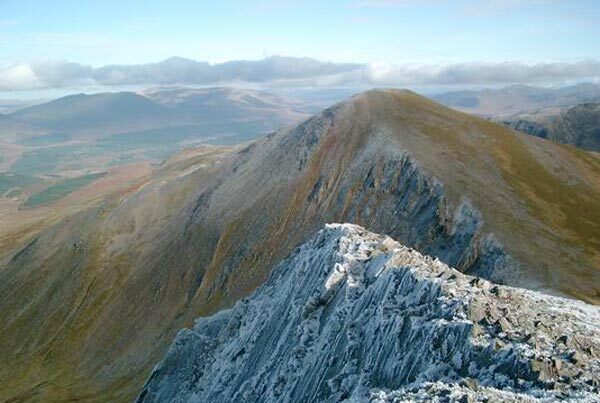 The summary information of one or more ascent routes that include Stob a' Choire Mheadhoin. 1 1078 m 16.08 km 5.5 hrs Stob Coire Easain and Stob a' Choire Mheadhoin Relatively easy route with little scrambling required but with some steep ascents. There is little exposure. Nick & Alan taking in the views with the Grey Corries in the background. 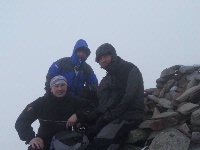 me & my good friends john frew & daw smith on the summit we had a great days walking & a great laugh what more can you ask for. 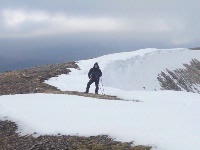 me returning from the summit of stob a choire mheadhoin didnt want to go to close to the cornice ridge. 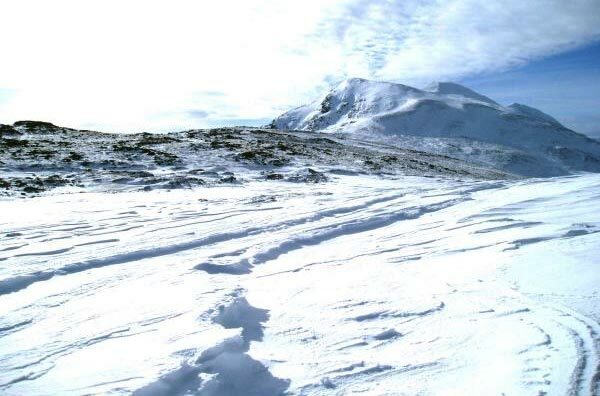 Post a few words about Stob a' Choire Mheadhoin or read what others have had to say. We did this in January with large and extended snow patches in places, rime and frost in other places which made it very slippy. The Cameron McNeish book states that this should take between 5 and 7 hours. With the condition it took us 10 hours. I have no idea how any reasonable mortal could do this in 5. As ever be prepared. As you get down from the col between Mheadhoin and Easain into the corrie there is a clear well trodden path that begins a contour around the west side of Mheadhoin's ridge. You may expect this to lead into a descending traverse towards the old tramway but in fact it never does. It continues in a high level contour eventually emerging onto the shoulder below Meall Cian Dearg where the ascent path is rejoined, if you started from An Dubh Lochan. If you are parked at the parking just before An Dubh Lochan this is no bad thing anyway, since it gives a more direct return to the start. From Fersit follow the track leading towards Loch Treig. Near the dam a new track leads a short distance uphill on to the moorland. From here there is a choice of boggy tracks leading to the survey pillar on the skyline. A very clear path takes a direct route over Meall Cian Dearg but it is being steadily eroded. Climbed this in high winds and fog on September 13th, 2003. Very straightforward, even in thick mist, although the path is faint in a few places. I recommend retracing the outward route in wet weather as it is very boggy if descending from the col.